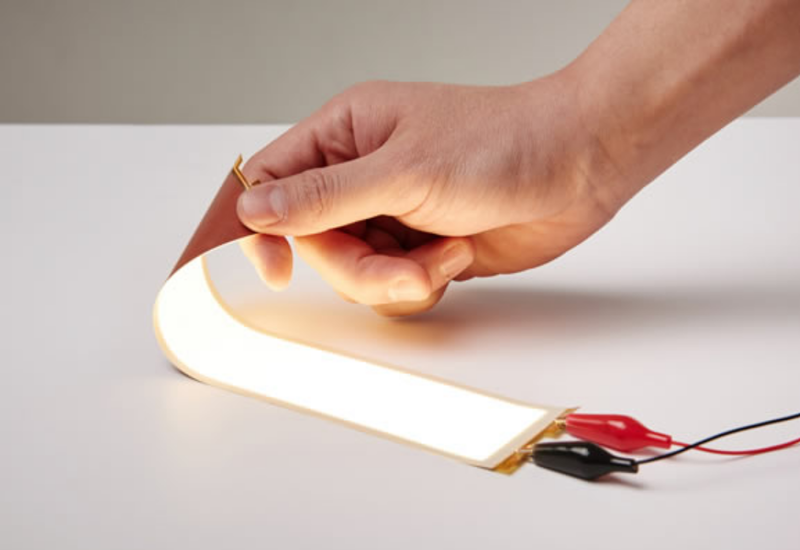 In late 2013, LG announced that it had created new “plastic OLED,” or “POLED,” displays. Since then, details on the performance of the new displays have been rather thin, but LG sings their praise every time they release a new product that includes them (e.g., G Flex, G Flex2, LG Watch R, & LG Watch Urbane). If you’re like me, you have a general working knowledge of the difference between LCD and OLED—the former has a backlight with pixels that block light, while the latter has no backlight and the pixels, themselves, emit light—but your grasp of their underlying concepts might not be particularly firm. Further, the benefits of POLEDs—other than curvy screens—isn’t exactly clear. I spent several hours this past weekend searching through Google, Wikipedia, and reading some technical articles about LCDs, OLEDs, and P-OLEDs (I’ll be using that hyphen henceforth since “POLED” sounds ridiculous), and I thought I’d share what I learned for those who are interested. First, let’s learn how LCDs work. Liquid crystal displays (LCDs) work by manipulating the polarization of light. In a liquid crystal display, you start with a backlight. The backlight underlies the entire display and produces the light you see on your screen; the brightness and color temperature of “white” that the screen is capable of displaying is dependent on the backlight. Unpolarized light emitted by the backlight travels through a polarizing filter, hits a film of liquid crystals, goes through a color filter (turning the white light into a red, green, or blue), hits a second polarizing filter, and finally exits the screen where it meets with your eye. The two polarization filters are oriented orthogonal to each other. What this means is that if light passes from the first filter to the second undisturbed, it will be completely blocked by the second—horizontally-polarized light won’t pass through a vertical polarization filter, and vice-versa. However, when light passes through a liquid crystal, its polarization is rotated slightly. Liquid crystals are ordinarily randomly oriented, but when they’re in the presence of an electric field, they reorient themselves to align with the electric field. This is the fundamental property upon which LCDs are built. The film of liquid crystals in an LCD is sandwiched between two glass substrates which house the electrodes and circuitry required to make the display work. When a current is applied between the electrodes in the two glass substrates, just such an electric field is generated, enabling us to manipulate the orientation of the liquid crystals. By manipulating the orientation of the liquid crystals, we can alter the polarization of the light that passes through them. And by controlling the polarization of the light passing through each liquid crystal—each pixel—we can control how much, or how little, light passes through the second polarization filter—we can control the brightness of each individual pixel. As an aside, you may have heard of LED displays. These types of displays are not usually seen in the world of mobile devices, but they’re still very common in the TV and computer monitor industries. To be perfectly clear, LED displays are LCDs. The only difference between a regular LCD and an LED variant is the backlight. Typical LCDs use CCFLs—fluorescent tubes—to power the backlight. LED LCDs use an array of hundreds of individual white LEDs. Benefits of using LEDs are numerous and include size, energy efficiency, heat, and image quality. In a typical CCFL-backlit LCD, the backlight is the size of the entire display. If you want to display a single white pixel on a sea of black, the backlight lights the entire screen just for that one pixel—this is why traditional LCDs have poor black levels. With LED LCDs, you need only to turn on those LEDs that are closest to the pixel you want to light, while all the other LEDs can remain turned off—this leads to better contrast and better image quality. Note that unlike an LCD where the polarizer is vital to produce an image, on an OLED display it primarily serves to improve clarity, filtering out internal reflections from outside light entering the display. OLED displays are what most Android manufacturers have opted to use, due to their excellent color quality, energy efficiency, and size. The benefits of OLED are numerous. One of the drawbacks of OLEDs, however, is that because each individual pixel emits its own light, each pixel on the screen can wear down at a different rate. Both LCD backlights and individual OLEDs will fade over time, getting slightly dimmer with each use. But in a traditional LCD screen, because the backlight underlies the entire screen, the entire display will dim as it wears down over time. On the other hand, in an OLED display, each pixel will wear down individually as it is used. As a result, if you have an area of the screen that is constantly displaying a static image (e.g., a statusbar, a HUD, or a retail demo homescreen), that part of the screen will wear at a different rate than the rest of the screen. Eventually, you will begin to notice those parts of the screen that displayed a static image for hundreds of hours are consistently a different brightness than the rest of the screen—you will be able to see a silhouette, measured by a difference in brightness, of the static image that was displayed. This is screen burn-in and there are not really any good ways to remedy it. This is an intrinsic problem with all displays in which each pixel has its own light source (plasma TVs also suffered from this malady, although manufacturers had fancy ways to minimize it in later generations). LG has been rolling out their “P-OLED” displays for a little more than a year, now—first on the LG G Flex, but subsequently on the Flex2, Watch R, and Watch Urbane. P-OLED displays are essentially identical to ordinary glass OLED displays with the exception that they replace glass in favor of plastic. As can be seen on the image to the right, by using plastic substrates instead of glass, LG has substantially reduced the thickness of displays. One downside to plastic versus glass is that glass has better optical properties—one of the reasons glass sunglasses are more expensive than plastic ones is because they’re clearer. LG has presumably addressed that issue, since aside from the original LG G Flex, reviews of devices with LG’s P-OLED displays have been in line with those with standard OLED displays. In addition to being thinner and cheaper, LG also suggests that P-OLED displays are more durable—plastic is flexible, and a flexible screen is less prone to shattering or chipping than a glass screen. Though LG doesn’t claim this itself, fans and some review websites have made claims as wild as “shatterproof” regarding the new P-OLED displays. The truth of the matter is that all mobile displays—LCD, OLED, and even P-OLED—have protective glass lying on top. Though the LG G Flex, Flex2, Watch R, and Watch Urbane may all have plastic screens underneath, they also have another thing in common—they’re all covered by a layer of protective glass. Reasons for this are myriad. For one, few enthusiasts are likely to be… enthusiastic about touching a plastic screen—it will likely feel like it’s covered with a screen protector. Secondly, plastic is not only flexible, but it’s also soft. While your flexible plastic screen might not shatter upon impact with the ground, each tiny little grain of sand is going to leave a permanent scratch on the display. LG therefore protects their P-OLED displays with very thin layers of glass (sometimes Gorilla Glass, sometimes an in-house product). By design, the material properties and the thinness of this protective glass layer make the glass, itself, marginally flexible. So LG’s claims of improved durability of P-OLED displays are probably reasonable, but internet claims of “shatterproof” are not—you can still shatter the thin layer of glass overlying a P-OLED display, even if it is a bit more flexible than that found on other phones. Finally, LG claims that an additional benefit to using plastic is that it enables the manufacture of screens with smaller bezels. How it does that, exactly, is a bit enigmatic; LG claims that it is due to “the fast electron mobility technology made the integration of different parts to be possible.” As to what that means, your guess is as good as mine. LCD technology is old and mature by now, and companies like Apple and Sony continue to innovate and produce very competitive displays with their devices. OLED technology vastly simplifies the hardware used in a display, but it brings with it problems related to burn-in and cost. With the advent of P-OLED, LG has further miniaturized, and reduced the costs of, the hardware required to make a good display. Additionally, by replacing the glass substrates with plastic, the resultant display is flexible. Though this improves the display’s resistance to shattering, it does nothing for its hardness—plastic is softer than glass. P-OLED displays must still be protected with a thin layer of glass (e.g., Gorilla Glass), otherwise they will be prone to scratches. The protective layer of glass applied to P-OLED displays this far is marginally flexible, but it is hardly “shatterproof.” Nevertheless, LG’s claims of improved durability over traditional OLEDs is probably reasonable, because P-OLED displays have no underlying thick glass substrates to break. P-OLED displays are unlikely to revolutionize the mobile device market, but they are an additional tool in the toolbox for manufacturers to use. Companies focused on premium image quality may continue to use LCD technology. OLEDs have both advantages and disadvantages, but for smartphones—whose shelf life is approximately two years—they will continue to be ideal for their unrivaled black levels and energy efficiency. As for P-OLEDs, the improved durability, thinness, and the addition of enabling unconventional display shapes and forms will surely give it a useful niche in the industry. Have you tried a P-OLED display? Tell us about your experience below! He is currently a graduate student studying earthquake seismology, but has always had a keen interest in all things related to science, technology, and gadgets. His first smartphone was a Samsung Galaxy Nexus, and he has had an interest in all things Android ever since.